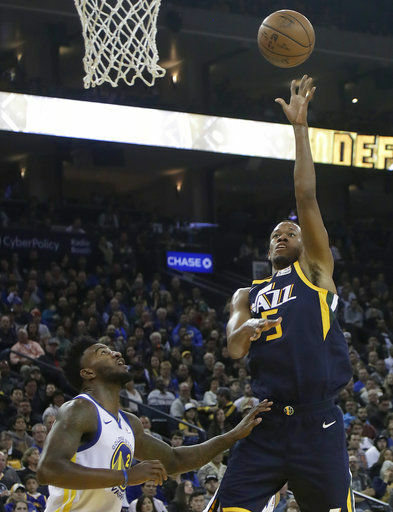 OAKLAND, Calif. (AP) — Kevin Durant scored 21 points, Draymond Green flirted with his second straight triple-double and the Golden State Warriors used another big third quarter to zoom past the Utah Jazz, 126-101 on Wednesday night. Jazz: C Rudy Gobert (left PCL strain and bone bruise) missed his seventh straight game. 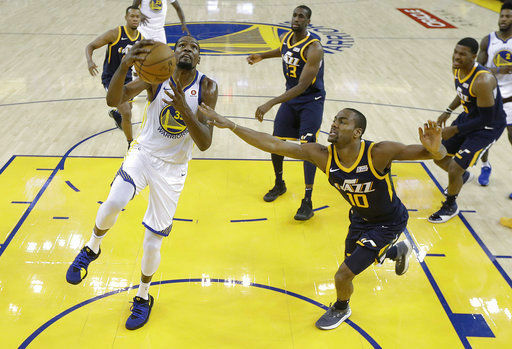 “They’re different because Gobert’s out,” Warriors coach Steve Kerr said. “That changes everything.” . G Raul Neto (concussion) was sidelined for the ninth straight game . Rookie Nazareth Mitrou-Long received nine stitches above his left eye Tuesday night after a late-game collision with the Nuggets’ Trey Lyles. He did not play Wednesday. Warriors: Stephen Curry, who missed his 10th straight game with a right ankle sprain, will scrimmage 5-on-5 Thursday and is scheduled to be evaluated Friday, before the Warriors’ game against Charlotte. “He’s frustrated, but I think he sees a light at the end of the tunnel,” Kerr said. “He’s getting excited now and it won’t be long before he’s back.” . In the team’s first nine games without Curry, Durant averaged 29.9 points, 8.9 rebounds, 5.6 assists and 3.1 blocked shots, with five games of more than 30 points. . Center Zaza Pachulia, who missed eight games with shoulder soreness, started for the first time since Dec. 6. Warriors: Host Charlotte on Friday.